My kids are always moving and providing them with fidgets and stress balls really helps them focus during lessons. We have a large variety of store bought fidgets and stress balls, but with my DIYer spirit I wanted to try making our own. 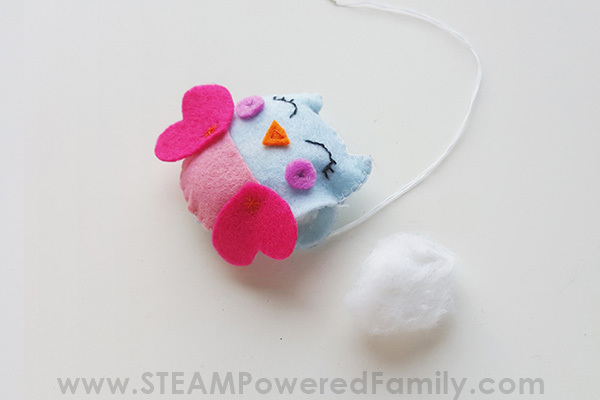 With this tutorial learn how to make a plush owl stress ball. Fantastic for your owl lover who likes to fidget or needs a little item to give them a confidence boost. We have a lot of fidgets and stress balls around here. When you have kids who struggle with anxiety, having something for them to do with their hands while doing lessons and homework or listening to a talk can really help them focus. Another thing we have seen is the calming effect having a favourite item in their hand can have when facing stressful situations. 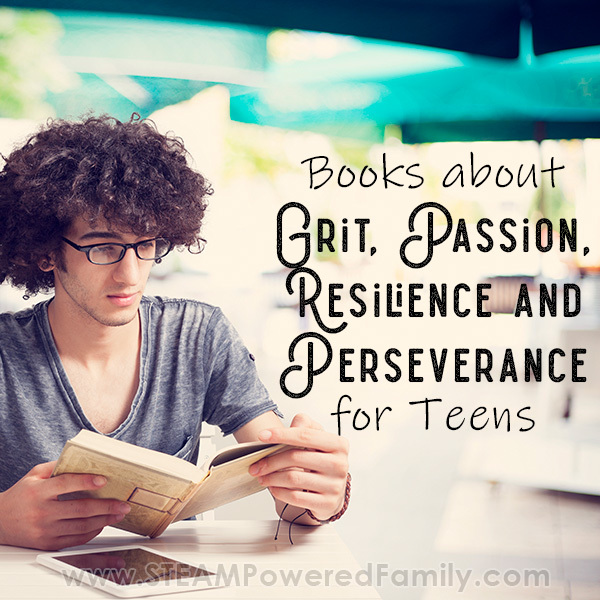 Just like they might have brought a beloved stuffed friend when they were preschoolers, now they are tweens and teens they still like having a little comfort item. Something to be with them and give them some strength when they are doing hard things. One thing I have heard from a number of parents and teachers is that they need fidgets and stress balls that do not use flour or balloons. The benefit of this project is that you can customize it to meet the requirements of the school as well as the sensory preferences of your child. IS IT A FIDGET? STRESS BALL? COMFORT ITEM? Here is where I get a little unsure about terminology. I did some research and frankly there is very little clarity around the use of these terms. I kind of like stress ball, even though it isn’t actually a ball shape. Fidget could work too but it doesn’t have any bits to manipulate, so I am not sure fidget is the right either. Comfort item is mostly used with babies to preschoolers, so definitely not something teens would appreciate. 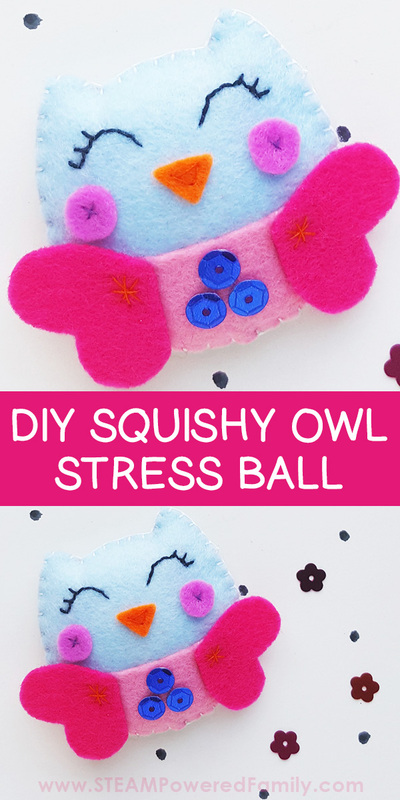 So how about calling this a DIY Stress Relief Owl! Maybe? Feel free to share your ideas in the comments. I want a great name for these! 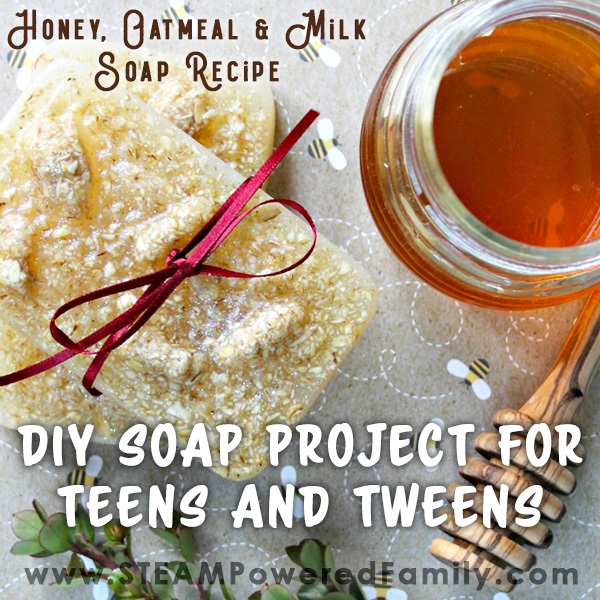 Whatever you want to call this, it is super cute and teaches teens some valuable skills. Plus, when teens make these little items themselves it really helps them feel a sense of accomplishment and attachment to the piece. 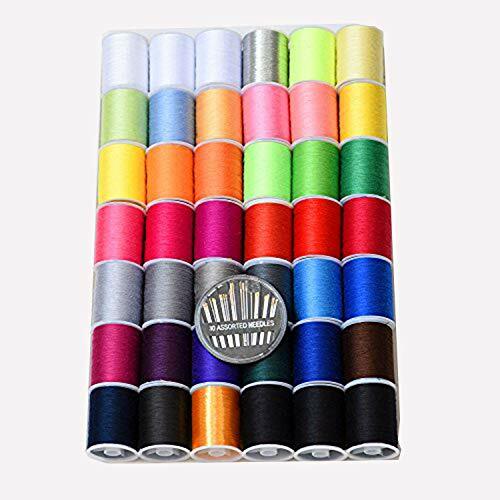 Thread in complementary colours to your fabrics, plus black or white. 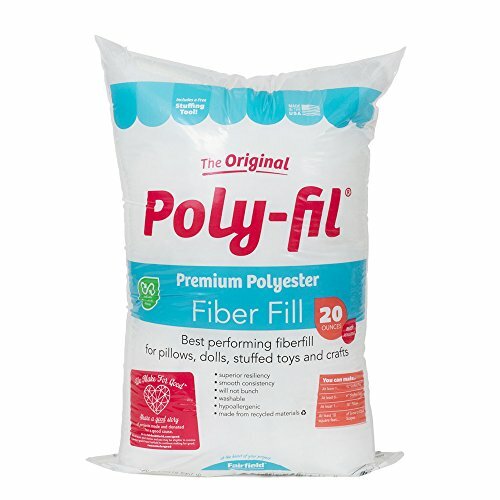 Filler – This can be based on preference but cotton, poly-fil, felt scraps, memory foam, make up sponges, a little balloon filled with dried beans or play dough, etc. all can work! Template – Sign up to our mailing list to get your free template. 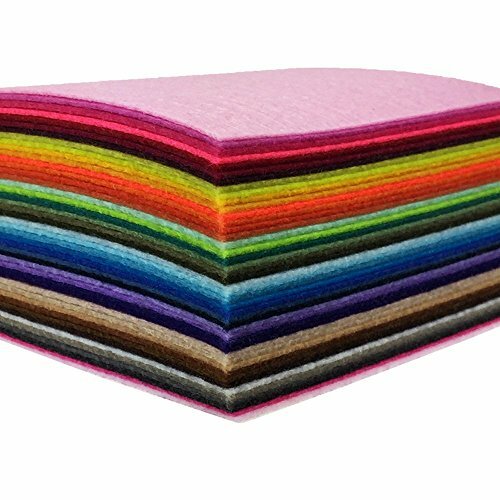 Select the colours for your felt fabrics. The design includes 2 pieces for the body, 2 heart shaped wings, 1 small triangle for the beak, 2 circles to create blushing cheeks, and 1 semi-circular pattern for the lower body part of the owl. We use one colour for each type of piece, but you can make every single piece a different colour, or use the same colour for a few pieces. Whatever colour palette appeals to you! Print off your free template and cut out the shapes. Trace the template patterns on the selected felt fabrics and cut them out using scissors. Using good sharp scissors will give you nice clean edges. Take one of the body cut outs that you want to be the front and use the pencil to trace eyes on the top. 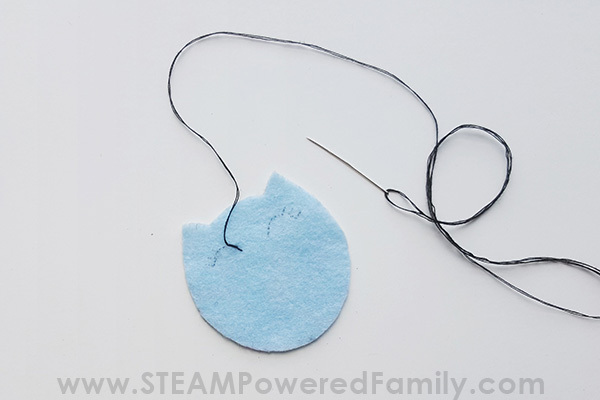 Use black thread to stitch the traced eyes. Once you are done stitching the eyes, draw the needle along with the thread, to the back side and tie 2 tight knots. Cut off extra thread after tying the knots. Doing this hides the knots on the inside. Place the lower body part, the blush and beak cut outs on the front body part of the owl. Position them as you prefer to make your owl look perfect! Prepare your needle and threads (we like using matching coloured thread for each part, or get creative and use a nice contrasting colour). Stitch on the parts to the front body piece. Place the 2 heart cut outs on both sides of the owl as if they were the wings. This means having them on their side. Stitch them with the body piece. We did a criss-cross stitch on the part the wing and the body part overlapped. This helped attach them together and it gives it a cute little accent. Once you are done stitching the front pieces all together, take the other body cut out and place it under the front body piece. Make sure to align all the sides of both body cut outs so they are perfectly lined up. 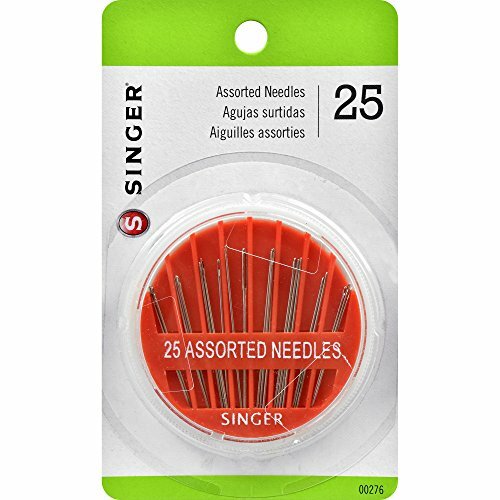 Prepare your needle and thread. Start stitching around the outside to join the two body pieces. We did a flat blanket stitch but you also do a running stitch. Continue to stitch until a gap or opening is left. Keep this opening big enough for stuffing the owl. Now is when we take our owl from being a cute little dude to a stress relief owl! 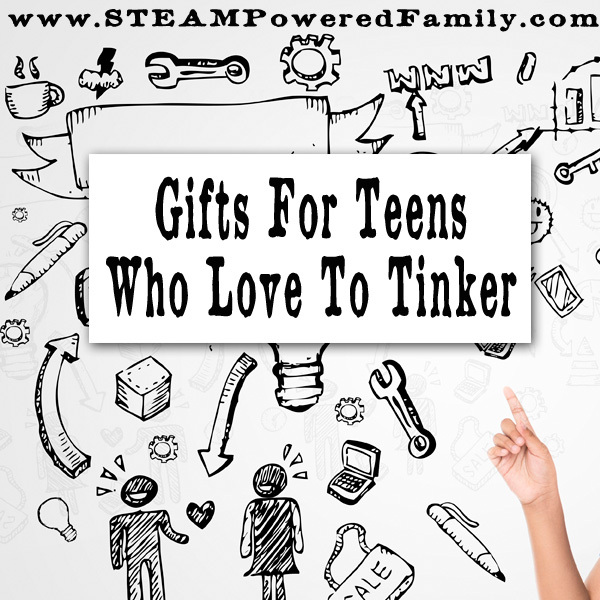 What you chose to use will be influenced by your own sensory preferences. 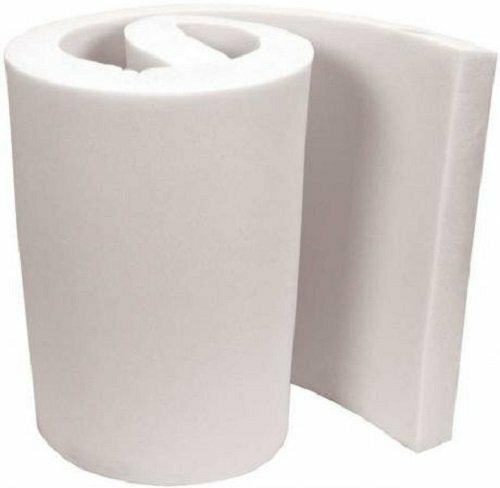 Traditionally poy-fil would be used, but memory foam can be a nice even squish that bounces back in the hand. Or if you like movement and a bit of weight you can use something like dried beans or even play dough in a balloon. Personally I like to add a little dried lavender to the inside of my owls. Sometimes I will also sprinkle a few drops of essential oil as well. I like to add the sensory experience of scent to these pieces. It’s important for our needs and helping with anxiety. Once you have stuffed the owl with your preferred filler, close the opening too secure the stuffing. Tie two tight knots and draw the needle inside the plush and randomly draw it back outside. Cut off extra thread. As a final touch you can stitch on a few sequins to give your owl some bling! Now squish and cuddle and hold that little owl close to give you a little boost! It’s the perfect size to fit in your pocket. 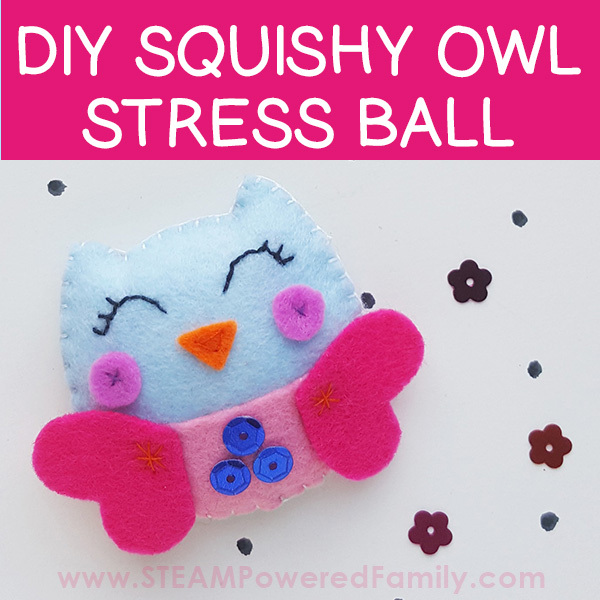 Enjoy your DIY Owl Stress Squishie!